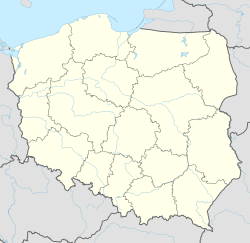 Szebnie [ˈʂɛbɲɛ] is a village in the administrative district of Gmina Jasło, within Jasło County, Subcarpathian Voivodeship, in south-eastern Poland. It lies approximately 10 kilometres (6 mi) east of Jasło and 42 km (26 mi) south-west of the regional capital Rzeszów. The town was the location of the Szebnie concentration camp during German occupation of Poland in World War II. The facility was constructed in 1940 originally as horse stables for the Wehrmacht next to a manorial estate. Thousands of prisoners perished there over the course of the camp's operation, including Russian prisoners of war, Polish Jews and non-Jewish Poles as well as Ukrainians and Romani people. The charred remains of the camp were entered by the Soviets on 8 September 1944. There was a SS training facility SS-Truppenübungsplatz Heidelager nearby at Pustków, for the Ukrainian 14th Waffen SS Division, as well as other collaborationists military formations. Their field training included killing operations at Szebnie. ^ "Central Statistical Office (GUS) – TERYT (National Register of Territorial Land Apportionment Journal)" (in Polish). 1 June 2008. ^ "HL-Heidelager: SS-TruppenÜbungsPlatz" (with collection of historical photographs). Historia poligonu Heidelager w Pustkowie (in Polish). Pustkow.Republika.pl. 2013. Retrieved 6 July 2013. ^ Terry Goldsworthy (2010). "Valhalla's Warriors" (Google Book preview). A History of the Waffen-SS on the Eastern Front 1941–1945. Dog Ear Publishing. p. 144. ISBN 1608446395. Retrieved 5 July 2013. ^ Howard Margolian (2000). Unauthorized entry: the truth about Nazi war criminals in Canada, 1946–1956. University of Toronto Press. p. 132. ISBN 0802042775. Retrieved 6 July 2013. This Jasło County location article is a stub. You can help Wikipedia by expanding it.